Walcott, who currently serves as president and CEO of the Queens Library, addressed more than 3,000 members of the Class of 2018 on May 19 at Fordham University’s 173rd Commencement, held on the Rose Hill campus. Speaking in the Lombardi Center during the ceremony, which was moved indoors due to the rain, Walcott noted that millennials will outnumber Baby Boomers in 2019 as the nation’s largest generation. And he pointedly told graduates that with this imminent shift comes great responsibility. Walcott, who received the President’s Medal from Joseph M. McShane, S.J., president of Fordham, shared his memories of taking late-night courses at GSS in the ’70s after working all day. He recalled waiting on the outdoor platform in the dead of winter for the No. 7 train at Queensborough Plaza. During moments like this, he’d often ponder his future. After recognizing that someone might be going through a more difficult time and could one day benefit from the knowledge he was gaining, he was further determined to succeed. 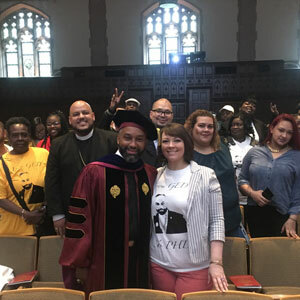 Father McShane, whom Walcott commended for his leadership in an era of “unprecedented tension and distrust,” described commencement as a golden day for the Class of 2018. He urged them to be active participants in our history. Father McShane also encouraged graduates to the use the lessons they’ve learned at home and Fordham as their compass. 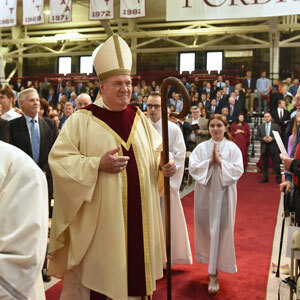 Cardinal Joseph W. Tobin, C.Ss.R., received an honorary doctorate of ministry at the Rose Hill Baccalaureate Mass on May 18. Fordham conferred honorary doctorates on nine other notable figures: Emanuel (Manny) Chirico, GABELLI ’79, chairman and CEO of PVH Corp.; actress Patricia Clarkson, FCLC ’82; Sherrilyn Ifill, president and director-counsel of the NAACP Legal Defense and Educational Fund; Marianne Kraft, principal of St. Athanasius School; Louise Mirrer, Ph.D., president and CEO of the New-York Historical Society; William S. Stavropoulos, Ph.D., PHA ’61, board chairman emeritus of the Dow Chemical Company; Cardinal Joseph W. Tobin, C.Ss.R., archbishop of Newark, New Jersey; Peter B. Vaughan, Ph.D., dean emeritus of the Graduate School of Social Service; and Anne Williams-Isom, FCLC ’86, CEO of the Harlem Children’s Zone. Despite the steady rain and cloudy skies, graduates found special ways to celebrate their accomplishment across campus. Some graduates danced playfully in the rain as they waited for the start of the procession. 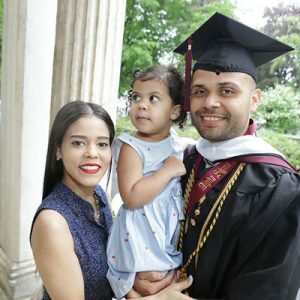 Others graduates like Manny Linares, a groundskeeper at Fordham’s Rose Hill campus, celebrated the end of their academic road and the start of a new journey with their families cheering them on. 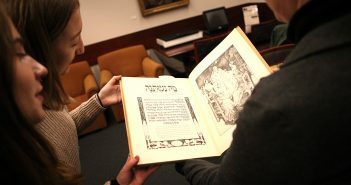 As a working student with a three-year-old daughter, Linares said his professors and advisers played a role in helping him to acomplish this feat. 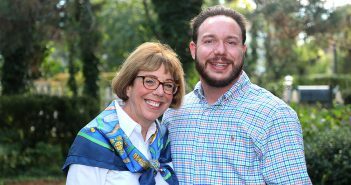 “I always wanted to get a degree, but I didn’t think it was something that was within reach until I arrived at Fordham,” said Linares, a first-generation graduate, who was recently admitted in the Masters of Science program in health administration. Emilio Alvarez, Ph.D., said he is excited to be a source of encouragement to those who face struggles similar to his own. After becoming an emancipated minor at 15 years old and receiving his GED in his early 20s, he received his doctorate in religious education today from the Graduate School of Religion and Religious Education. He’s serving as a chaplain at a federal detention facility in Batavia, New York. Photos by Bruce Gilbert, Chris Gosier, Dana Maxson, Matthew Septimus, Chris Taggart, and Gina Vergel. Video by Tom Stoelker and Jeff Coltin.